Mount server, network or telecommunications devices vertically with this 3U wall-mountable rack. The RK319WALLV 3U 19in Steel Vertical Wall Mount Equipment Rack Bracket offers a versatile storage solution, allowing equipment (Network devices, power strips, patch panels) to be mounted vertically (flush with wall) to save space. Alternatively, the 3U bracket can be installed under a desk for horizontal installation, making it easy to access installed equipment directly from your workspace. 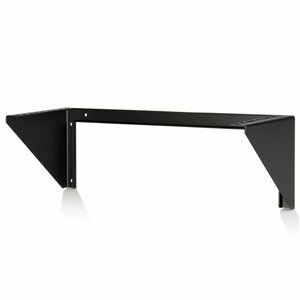 This TAA compliant product adheres to the requirements of the US Federal Trade Agreements Act (TAA), allowing government GSA Schedule purchases.Constructed to EIA-310 19in rack standards, the wallmount bracket features a sturdy steel design, perfect for SoHo (small office, home office) environments. The wallmount bracket offers space-saving installation for environments lacking the footprint space for a full size server equipment rack.Suitable for mounting on virtually any wall/ceiling surface (e.g. drywall), the bracket mounting holes (used to mount to a wall or the desk underside) are positioned at exactly 16in apart, matching standard construction framework.Need more storage space? StarTech.com also offers a RK119WALLV 1U 19in Wallmount Bracket, a RK219WALLV 2U 19in Wallmount Bracket and a RK419WALLV 4U 19in Wallmount Bracket. What's Included 1 x Vertical Wall Mount Bracket; 12 x Cage nuts and screws (12 Each); 6 x Self Tapping Wood Screws - 3/16" x 1 1/2"
The RK319WALLV 3U 19in Steel Vertical Wall Mount Equipment Rack Bracket offers a versatile storage solution, allowing equipment (Network devices, power strips, patch panels) to be mounted vertically (flush with wall) to save space. Alternatively, the 3U bracket can be installed under a desk for horizontal installation, making it easy to access installed equipment directly from your workspace.